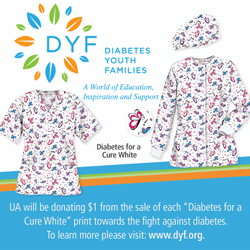 Uniform Advantage will donate $1 from the sale of each “Diabetes for a Cure White” scrub print to the Diabetes Youth Families this Spring 2015. To learn more, please visit http://www.uniformadvantage.com/a-day-in-scrubs/ua-gives-back/diabetes-youth-families.asp. It is truly fantastic to see charities like Diabetes Youth Families create this type of nurturing and supportive environment for these families to cope with this condition. Diabetes Youth Families (DYF) was founded 78 years ago and is accredited by the American Camp Association. Their mission is to improve the quality of life of individuals of all ages – children, teens and families affected by Type-1 Diabetes within a supportive community environment. In 2014, their camp saw 2,050 individuals. DYF’s programs have boosted these families’ confidence levels on how to manage this condition better, and walk away refreshed with a new vision for their lives, and energized that anything in life is possible for them. Uniform Advantage is a leading retailer of scrubs and medical uniforms. Founded in 1985, the company operates out of Plantation, Florida and ships from their distribution center near Atlanta, Georgia. It has grown to include 30 retail stores located in key cities across the U.S., a catalog division and an entity dedicated to the online market. For more information and to view their garments, visit the Uniform Advantage website at http://www.UniformAdvantage.com or call 800-283-8708.